(PhysOrg.com) -- Hotel guests come and go. But in the first decade of the 1900s, a pair of frequent Russian visitors to the Hotel Parisiana, near the Sorbonne on Paris' Left Bank, stood out vividly. The children of the hotel's proprietors, the Chamont family, remembered them into the 1970s as 'hardworking' and 'pious' men. The guests, Dimitri Egorov and Nikolai Luzin, were mathematicians, studying in Paris; they often prayed and went to church. The Russians were embarking on a grand project: exploring the unknown features of infinity, the notion that a quantity can always increase. Infinity’s riddles have fascinated intellectuals from Aristotle to Jorge Luis Borges to David Foster Wallace. In ancient Greece, Zeno’s Paradox stated that a runner who keeps moving halfway toward a finish line will never cross it (in effect, Zeno realized the denominator of a fraction can double infinitely, from 1/2 to 1/4 to 1/8, and so on). Galileo noticed but left unresolved another brain-teaser: A series that includes every integer (1, 2, 3, and so on) seems like it should contain more numbers than one that only includes even integers (2, 4, 6, and so on). But if both continue infinitely, how can one be bigger than the other? As it happens, infinity does come in multiple sizes. And by discovering some of its precise characteristics, the Russians helped show that infinity is not just one abstract concept. Egorov and Luzin, with the help of another colleague, Pavel Florensky, created a new field, Descriptive Set Theory, which remains a pillar of contemporary mathematical inquiry. They also founded the Moscow School of mathematics, home to generations of leading researchers. 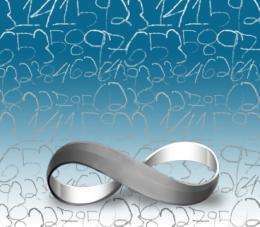 In studying infinity, the Russians followed Georg Cantor, the German theorist who from the 1870s to the 1890s formalized the notion that infinity comes in multiple sizes. As Cantor showed, the infinite set of real numbers is greater than the infinite set of integers. Because real numbers can be expressed as infinite decimals (like 6.52918766145 … ), there are infinitely many in between each integer. The set containing this continuum of real numbers must thus be larger than the set of integers. In Cantor’s terms, when there is no one-to-one correspondence between members of infinite sets, those infinities have different sizes. Cantor’s work made it clear that the study of infinity was actually the study of sets: their properties and the functions used to create them. Today, set theory has become the foundation of modern math. But in the aftermath of Cantor, the basics of set theory were unclear. As Graham and Kantor describe it, even leading mathematicians found the situation unsettling. Three French thinkers — Emile Borel, Henri Lebesgue, and Rene Baire — who made advances in set theory nonetheless decided by the early 1900s that the study of infinity had lost its way. They felt theorists were relying more on arbitrary rule-making than rigorous inquiry. “The French lost their nerve,” says Graham. By contrast, Graham and Kantor assert, the Russian trio found “freedom” in the mathematical uncertainties of the time. It turns out there were plenty of concrete advances in set theory yet to be made; Luzin in particular pushed the field forward in the 1910s and 1920s, making discoveries about numerous types of sets involving the continuum of real numbers (the larger of the infinities Cantor found); Descriptive Set Theory details the properties of these sets. In turn, many of Luzin’s students in the Moscow School also became prominent figures in the field, including Andrei Kolmogorov, the best-known Russian mathematician of the 20th century. Naming Infinity argues that the Russians thought their mathematical inquiries corresponded to their religious practices. The Name-worshippers believed the name of God was literally God, and that by invoking it repeatedly in their prayer, they could know God closely — a heretical view for some. Graham and Kantor think the Russians saw their explorations in math the same way; they were defining (and naming) sets in areas where others thought knowledge was impossible. Luzin, for one, often stressed the importance of “naming” infinite sets as a part of discovering them. The Russians “believed they made God real by worshipping his name,” the book states, “and the mathematicians … thought they made infinities real” by naming and defining them. Graham also suggests a parallel between the Russians and Isaac Newton, another believer (and heretic). Historians today largely view Newton’s advances in physics as part of a larger personal effort — including readings in theology and alchemy experiments — to find divine order in the world. Similarly, the Russians thought they could comprehend infinity through both religion and mathematics. Moreover, Mazur agrees that the connection between the religious impulses of the three Russians and their mathematical studies seems significant, even if there is only a general affinity between the two areas in matters such as naming objects. “It is more a conveyance of energy, than a conveyance of logic,” Mazur says. Religion could not trigger precise mathematical moves, he thinks, but it provided the Russians with the intellectual impetus to move forward. Naming Infinity also starkly recounts the sorry fates of Egorov and Florensky, as publicly religious figures in atheist, postrevolutionary Russia. Egorov was exiled to the provinces and starved to death in 1931. Florensky, a flamboyant figure who wore priestly garb in public, was executed in 1937. Luzin was spared after the physicist Peter Kapitsa made a direct appeal to Stalin on his behalf. These men were not just endangered by their religiosity, however, but also by their style of math. The intangible nature of infinity contradicted the Marxist notion that intellectual activity should be grounded in material matters, a charge made by one of their accusers: Ernst Kol’man, a mathematician and seemingly sinister figure called “the dark angel” for his role as an informant on other Soviet intellectuals. The Russian trio was thus part of a singular saga, belonging to a now-vanished historical era. Naming Infinity rescues that story for readers who never had the chance to hear it directly from the owners of the Hotel Parisiana. Although the size (i.e. cardinality) of the set of real numbers is indeed bigger than that of the integers, it is not because "...there are infinitely many in between each integer." The set of rational numbers is a counterexample to this argument; there are infinitely many rationals between each integer but the set of rationals is the same size as the set of integers. I would compare the part about infinity coming in different sizes to time and its different speed of flow. The only real number, quite paradoxically, is zero. All the rest of the numbers are there to represent zero's flow through time. Numbers are just time and space, simplified, condensed into one. P.S: Note only do numbers represent zero's passage through time, but it also represents energy/zero's subtle shifts in its tone/characteristic/properties during that time, where each number is a "phase". P.P.S: I forgot to tell that the opposite (regarding numbers and zero) is also true. After all, that's why it's called a zero. Both theories, about everything being zero and zero being nothing/unachievable are true. Kindda like your right hand is left in the mirror.